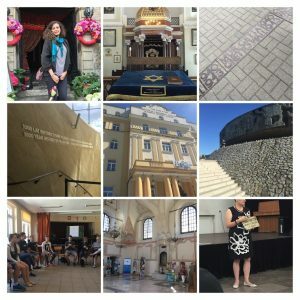 I spent last week in Poland as a member of an Educator’s Group from Facing History And Ourselves working with the Polish Organization Forum for Dialogue, a non-Jewish organization working with young Polish students to uncover the rich and vibrant Jewish history, or as they like to say, Polish history. Below is an excerpt from my travelogue, written after spending Shabbat in the southern Polish town of Szczevrzszyn. There is something uneasy about stepping into the past. Searching for voices, names , and stories within the rubble of a troubled time can never be easy. It brings trepidation and worry. What will we find? How will we process the embers left behind by the fire? And then we arrive, in a little southern Polish town of Szczevrzszyn, whose name no one can say without laughter and much tripping over the tongue. Here, we meet Polish teachers dedicated to the task of preserving a history that is richly ours, but uniquely theirs. They are kind, they are inspirational, they are unexpected. Here, over the light of Shabbat, two diverse world collide in friendship and understanding. With a prayer service on the lawn, our new friends experience Shabbat through our lens. Watching Oren in his tallit, pray with fervor and passion, allows us to experience the sounds of Shabbat as they may have been before the war. We hear our ancestors voices, rising from their earthly resting places, traveling though us towards heaven. Imagine the sounds of olden Szczebrzeszyn. Warm summer nights, with windows open and the sounds of prayers and Shabbat joy. Through our unique, traveling family, we found a joyful place and returned to our roots. We rise in the morning, and walk much like the Jews of Szczebrzeszyn once might have, to synagogue. There, we are reunited with Gocia, who alone, inspires us with the stories of her search to uncover meaning from the past. From the Streicher family, to the house of fallen stairs, to the Grandpa who hugged a tree, her images remind us of the simple and special world that was once here. We are inspired by her fight to preserve it’s memory. We experience these lives through her stories and passionate connection to this place and the Jewish people. We hear the stories of simple lives once lived through the book Memories of a Shetl , and a few of us walk in the footsteps to spend Shabbat as it once was. From the river, to Fleischer’s steps, to our dinner together, Shabbat in Szczebrzeszyn is a holy and happy time for each of us. Before the stars arrive to usher in the new week, we gather in a circle to face one another, and face the reality that our trepidation and worry has turned to joy and wonder. Who would believe us? How do we share? How can we translate the gift of Shabbat in Szczebrzeszyn, the gift of these righteous people doing unimaginable work, to Americans living under the burden of a vast and violent legacy? Our friends and family at home are us only a week ago, but now we feel compelled to share a new story-a complicated and yet, beautiful tale of a loss and a rebirth. What will a future Poland look like, a future of possibility? Of course we recognize that we have met very exceptional people, filled with passion and drive and openness. But imagine, sitting for Saturday evening dinner, to be interrupted by a stranger who asks if we are a Jewish group. He tells us that he is the oldest living resident in Szczebrzeszyn who would remember the Jews. He was so proud to have us in his town and share his memories of forgotten friends. He mourns with us and celebrates with us. Two narratives, seemingly opposed, joined under the night sky of Szczebrzeszyn. Our Shabbat ends with Havdalah. This week, it really marks a separation. Not only the holy from the regular, but from who we were upon arrival, to who we have become during this trip. We have been left with loving thoughts of who we each might become. We are forever changed by this simple, restful Shabbat in a little Shtetl.